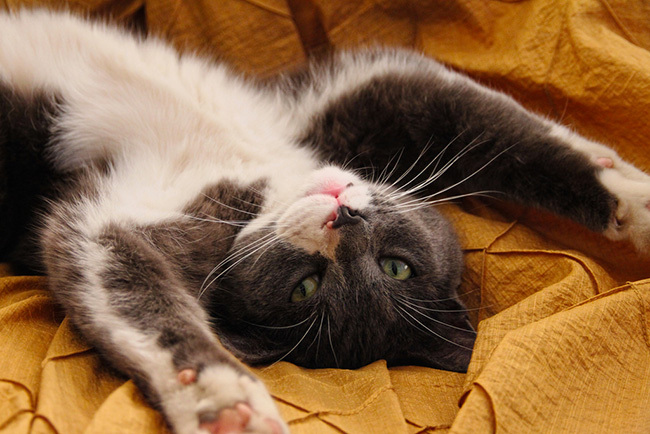 If you want to write copy that converts, you can’t afford to be lazy. Image by Martie Swart via Flickr. Copywriters walk a fine line between adhering to best practices and thinking outside the box. On the one hand, you don’t want to mess with what works. On the other, you need to get adventurous if you’re going to stand out from the crowd — nothing kills conversions like lazy copywriting. In this episode of the Call to Action podcast, Copy Hackers co-founder Joanna Wiebe challenges marketers to take chances with their copywriting, and pinpoints three common mistakes that result in lazy copy that just doesn’t convert. Whether you should build your landing pages starting with the copy or the design. Why discounts and promos won’t always help your copy convert better. How to pitch your bold, adventurous copy to your boss so it doesn’t get rejected. Death to Fear And Laziness! How to Push Yourself to Write Sticky Landing Page Copy by Joanna Wiebe via Call to Action Conference. Theme music brought to you by the great folks at Wistia. Unbounce’s Content Strategist, Dan Levy, interviews Joanna Wiebe, co-founder of Copy Hackers. 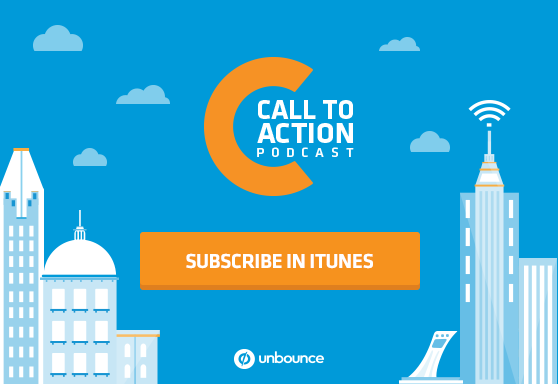 Stephanie Saretsky: I’m Stephanie Saretsky, and you’re listening to Call to Action, the podcast about creating better marketing experiences. There’s a theory out there… that forces are gathering against us. You’ve heard the slogans: dare to be different, stand out from the crowd. But how many times have you actually seen that rewarded instead of punished? Joanna Wiebe, co-founder of Copy Hackers, is on a mission to inspire marketers to take chances with their copywriting and just stop being lazy. Our Content Strategist Dan Levy spoke with Joanna about the talk that she gave at Unbounce’s Call to Action Conference this year in September on the three things that copywriters are doing to produce truly lazy copy and how to fix it. Dan Levy: All right. You start off your talk with a very strong statement, which is that we’re all just being lazy. And I’m curious. How did you get to the point where you’re comfortable calling 500 marketers lazy to their faces? It must have just been like a breaking point, I assume? Joanna Wiebe: I’m like – I’m very grouchy now, 12 years in. I think it’s better than saying it behind their backs, which I think is what a lot of us end up doing, right? Like you keep seeing the same mistakes. You know what the cause is of the mistake. It’s one part laziness, and lazy is a big word packed full of stuff, right? So there’s fear inside of it; there’s all sorts of stuff inside lazy. But it does come down to this sense of laziness, yeah, where you can – again, yeah, you see these mistakes that people keep making, and they keep writing to you and saying, “What can I do differently?” And when you tell them what to do differently, they’re like, “Oh, I don’t have time for that.” And you’re like, “Well, I can’t help you if you don’t make this a priority.” And so that’s really where I was coming from. And you know, again and again I worked over different titles for the talk because I’m not generally a negative person. And saying, “Oh, you’re just being lazy” is a little bit harsh and kind of negative sounding. But the other ones that I was toying with — the other titles for the talk — they were kind of lazy in themselves. Because the real message, the actual message is stop being lazy. Start saying things. Start caring. And so if I went a different route, which I tried to do but it just didn’t work, itself would have been lazy. Dan: Yeah, there’s no sense beating around the bush. Joanna: Right? We’ve got like 40 minutes up on the stage so you better, like, get it out there instead of just dancing around and giving little, you know, soft statements — which is perfectly fine if you’ve got lots of time to kill. But if you don’t, then what? Dan: Yeah, well, a little tough love. I like it. Dan: Well, you illustrate your point in your talk with an example from Twitter. I think you show an email about how to use Twitter cards – an email that you received, I presume – and the call to action button says create a website card. Can you tell us what happened when you went ahead and clicked on that CTA? Joanna: Yeah. I landed in Twitter, in app, in my account on a page where the only word that was close to what I had just read was the word “card.” But it was in relation to your credit card. So I landed on a page where you were supposed to set up an ad that was some sort of website card. I don’t know. And it led essentially with – or it had highlighted on the page, you know — you’ll need to enter your credit card. And I was super confused. So for me, that was like a moment of obvious laziness, where we could make a lot of excuses for why Twitter, for all the brilliant people at Twitter, and I find it very hard to believe that they hired people who didn’t understand this. But we can make excuses for why they didn’t engage properly in message matching, and just this very basic concept of repeating what you said at the end of the last thing you said to somebody — you repeat that at the beginning of the next thing you’re saying to them, right? So in an email, if you’re telling me about creating a website card, and it finishes with, “Create a website card” and I click on that, that’s the button – it says it twice, the exact, same language twice. So it’s not like they didn’t know where they were driving us. They knew what the point was. I mean, evidently they might not have known where they were driving us but they knew that they were trying to get us to create a website card. And then to land all of these people, when you’re Twitter and your whole monetization strategy is to get advertisers to pay, this is the moment at which you could actually start making money. And you drive us from an email that you worked hard on right in app without anything in between, without the landing page that was required to help ease me in and every potential customer into the act of creating a website card. So their landing page had no mention of “Create a website card” and it was just a bloody disaster. Dan: It’s like they couldn’t wait to ask for your money. So they’re like, “Credit card, website card, credit card,” right? Joanna: And I’m thinking, “Oh, they’re – okay, they’re testing it. They must be testing it.” And so a week later, I got the same email from them, different subject line. I opened it, read, thought it was exactly the same and I’m like, “You’re kidding me. This better not drive to the same place.” So I click “Create a website card” and voilà, I land on the exact same in-app page. So if they were testing anything, it was the subject line and that’s hardly the problem in this experience. Dan: Come on, Twitter, do better. Joanna: Right? Stop being lazy. Dan: So you say that we’re all guilty of at least three moments of copy laziness on our landing pages. The first one has to do with starting with design instead of copy. Can you talk about why that’s such a lazy mistake? Joanna: Yeah. A good deal of this is anecdotal, from working with clients and working in house and seeing the parts that people jump to. So the things that you jump to are the things that you really want to do, in most cases. And then you leave the hard stuff for later. And jumping to design is so often what we do. And again, there’s lots of excuses for that. But if you start with design, then you have to push your messages into this design you came up with. The point of your page is not to put something beautiful out there, right? That’s art. The point of your page is to do something good for your business like get a lead or make a paid conversion, or get people to sign up for your newsletter (which is also, of course, like a lead). But there are these things that you’re trying to get it to do, so why on earth would you start with the look and feel of the layout for messages that you don’t even have down, yet? Where you don’t even know what you’re going to say. It’s really hard. But when it comes down to it, it’s supposed to be easy. It’s just words, right? Writing copy is supposed to be easy. Joanna: Yeah. Where – right where you’re talking about having copy lead design. And that’s okay. It’s actually – you know, it’s better for everybody if copy leads design. Things go a lot faster. Dan: Oh, our design team begs us for copy before starting a project. And in fact, they’ll refuse to start a project – even build a landing page – without the copy. So this isn’t like – yeah – was that a polite applause? Joanna: Yes, I’m applauding you and your team. Dan: Yeah. I mean credit goes to our design team for saying, like, no, content informs design. Without content, design is just decoration. Joanna: It is, right? And you know that, but I think that when I’m really talking to small businesses — smaller and fast growing businesses — a lot of them are doing these things on their own. So they don’t have a design team that can say, “Absolutely you should lead with copy, or at least give us the messages first and let’s talk about messaging hierarchy before we talk about the visual side of things.” So they’re doing it themselves and they’re like – again – attacking the fun stuff. But this is why they need to be told these things. Like, “Look, the Unbounce team leads with copy,” right? And Basecamp leads with copy, and these businesses you look up to are leading with it. It’s hard – it’s harder. It’s going to take you stopping and not doing the same things you’re used to doing and not jumping into the fun part. But it’s the better way to do it. Dan: Oh, so much more we could talk about here but I want to move onto another mistake that you talk about in your talk, which is saying exactly what your competitors are already saying. Why do you think so many marketers are afraid to get a little adventurous with our copy? Joanna: For a lot of reasons, right? I think that it’s a scary thing. I often forget that it’s a scary thing to put yourself out there and say something different. And I had somebody who was working for me, he was a brand new copywriter just out of school. He’d written like for the university paper and stuff like that. But he’d never, like, written copy. So he was learning how to do that. So I had him write a page for a client. We went back and forth on it again and again and got it to a good place. And then I was like, “Okay, now put it in” – I believe it was actually Unbounce we were using – “okay, now go put that in Unbounce and hit publish.” And he was like frozen, like, “What are you talking about,” right? Like he couldn’t believe he was actually going to put his words out there. And I had long since forgotten that feeling of being like, “Oh, there’s fear associated with this? There’s like scariness about hitting publish?” I’d completely forgotten that. Maybe not with blog posts, because I still feel it there. But with a page, I absolutely don’t feel that. But he did. I’m sure it’s reflective. Of course it is — I see that with lots of other people who are writing their own copy and marketers. This fear of actually hitting publish and having it go live. And so you tend to lean towards the type of copy that is going to make you less afraid when you hit publish. So saying things that are similar to what your competitors are saying. There’s huge safety in that, right? This is like a big psychological principle: heard behavior, right? We do what others do — it makes us feel safer. So if you say something different from what others are saying, especially if you’re already not super confident as a copywriter, you’re really putting yourself out there. So I don’t blame people for this fear of getting adventurous, as you say, with your copy. But now that we know that yes, there is a fear there and yeah, a lot of people feel it — now there is this opportunity that’s opened up when you take that risk and you say something that nobody else, none of your competitors, would dare say. Because you can actually – if you do that — you can stand out. Dan: That makes me wonder how much of it is motivated by laziness and how much of it is actually fear, or if fear is just like that deeper subconscious thing that’s underlying the laziness and it comes down that. Joanna: It manifests itself as laziness but it’s fear, absolutely, that’s like riding underneath the surface and preventing you from doing things that could really move the needle. But they could move the needle in either direction, right? It could completely tank. It could be brutal. And so with that in mind, if you don’t know if it’s gonna work, and maybe you don’t have enough traffic to test, well why would you even risk it, right? Why not just say the same thing, continue on with your 2 percent conversion rate that you can keep reporting to your boss as, “You know, we’re doing well — we’re still converting at the industry average of 2 percent.” And you don’t have to really risk anything. So yeah, absolutely there’s huge fear under it all. Dan: Of course there’s also a huge opportunity in the fact that everyone else is saying the same thing, right? Joanna: Yes. Oh, my gosh. So if you just say something that nobody else is saying. If you just use as a filter for the next thing you write: “Would my competitor say this?” And if they would, don’t say it. Just try that, right? If you’re using Unbounce, make a new variation of your page. And just take everything you’ve got there and change it to something that your competitors wouldn’t say. And that means using different phrasing. It doesn’t mean you have to change what you’re selling, obviously. I’m talking more about the copy – the actual how. Not what you say but how you say it, a lot of the times is just a great way to separate yourself from your competitors. So just making those changes to the actual words you’re using. Trying to use stickier copy. Things like word pictures and tapping into, you know, the sense of even scent or motion and different things that you’re just not doing in your copy, that your competitors are definitely not doing in their copy, and that makes this whole thing a very big opportunity to differentiate using just your words. Dan: Well, one way to do that is to use – actually use words that no one else is using or that you don’t see very often. And you talk about how a change in copy for a boring, old online warranty company resulted in an 87 percent increase in click through rate in one of your clients. Can you talk about that one? Joanna: Yeah. This was for an ad, and this is for someone that I work with who got this result. It was an ad about an online warranty company, like what is that, even? It sounds like the most deathly, boring place to work, right? But just using words – and I believe if I’m recalling it correctly, it was something to the effect of not being stupid. But yeah, saying something in their ad that was very different and that they were a little uncomfortable with, too, right? And usually that’s a good way to know if you’re on the right track to something that could actually work. It doesn’t make you feel uncomfortable and then maybe at least that alone makes it worth testing. Obviously, not so uncomfortable that it’s like – like we don’t want to be offensive. We don’t want to cross lines. But push it. Push it a little further and then you can get big increases not only – for them, it was not just an increase in their click through rate, which was great. But of course people landed on the page and stayed there more and your quality score goes up. And it gets less expensive to run that ad. So all of these good things happen when you write better ads and drive them to landing pages that have matching content, of course. But so much more is at stake than just even getting a better click through rate. There’s so much more that can be – that will come of great efforts to say something different, make yourself uncomfortable, and of course test it. Dan: How hard was it to persuade or nudge the client into doing something a little bit risky there? Dan: You’ve got nothing to lose. Dan: See, that’s something a bit subversive and even a bit conspiratorial in your talk. And I think you know what I’m about to ask about, which is that the world actually secretly wants us to be lazy. What do you mean by that? Dan: I knew it. I knew you were – yeah. Dan: You are from Vancouver Island so that makes sense. Joanna: What are you gonna do, right? I live on Vancouver Island so I have to be. But yeah, so there are theories galore. There’s an entire school called the Frankfurt School that was all about – any literary theory or critical theory geeks are like: yeah, Frankfurt School, Adorno. Because it should be because it’s very cool. All of this completely interesting thought on how we’re fed a certain reality even though we’re told something very different, right? What’s normalized versus what we’re told? So we’re told it’s good to be different. But how often is that actually what happens? Rarely rewarded to be different, even though it’s said again and again that you should be. But we see all these examples of people who are different, and the bad things that happen to them, right? So if you want to try to be different, if you actually get that courage up to be different, to say something different in your copy, say something that might actually matter and stick with people; you’ve got all of this pressure on you and on the people around you who are going to be reviewing your copy to not do that. To stick with the status quo, to not stand out, right? To not be noticed even though the only way to be noticed, and the good things that come with being noticed, the only way to do that is to actually stand out and say something different. So you’ve got, as I’ve seen it, “forces.” I know how that sounds, right? I know it sounds like I’m handing out pamphlets on a corner or something. But it really is all of this pressure to be exactly like the person next to you. I’ve seen that’s probably the biggest encumbrance when it comes to writing better copy. You’re told you’re supposed to do it but as soon as you do it, you’re usually punished in some way for it, right? So I gave examples of studies that have been done where difference is punished because difference is – things that are visibly different or sound different are the easiest things that we’ve been trained all of our lives to question and punish those things because it’s not safe — it’s abnormal. And so how could a person break out of this day-to-day, ho-hum boring stuff that we say when there’s nothing but punishment waiting on the other side of it? There’s so rarely a reward for it, which is sad. Dan: Yeah. Yeah, I don’t think you need to be a conspiracy theorist to realize that for the most part, people are just comfortable with what they know and with the status quo. And I don’t know, maybe I’m showing my true colors here, too. But that really resonates with me that most people veer towards the comfortable or are unsettled by things that are a little bit outside of that. And so that’s just – to me, that’s just a huge opportunity for those of us who are willing to take those risks and to put themselves out there. Joanna: Totally, and to be that first person to try, which is like the hardest – well, the follower, I guess, from what I understand is harder than being the leader. The first follower. But try, right? And that’s where A/B testing can be very liberating. There’s a flip-side where you’re forced to prove everything you do. So there are hard things that come with A/B testing. But there’s also a chance for big liberation and saying I know we’re uncomfortable with it; it’s different from what we’ve been saying. It’s way different from what our competitors say. Our CEO, we probably won’t even tell him or her that we’re doing this test because they’d be like, “Nope, never do it.” But we’re going to just – we’re gonna put it out there. We’re gonna expose this creative, different approach to messaging. We’re going to expose it to 20 percent of traffic. We’re just gonna keep that risk down but we’re really gonna test it. And if you can at least do that, then you know you can move forward toward, like, “liberation.” Wow, all of these lefty things that I’m saying. Dan: Yeah. You know, of course we’ve all been in situations where we’ve tried to write something bold and different and something we maybe think is awesome. But it ends up getting rejected either by our boss or our client or some other stakeholder who swoops in. How can we as marketers, and as copywriters in particular, do a better job going to bat for those bold, beautiful, un-lazy copy ideas? Joanna: Un-lazy, I like it. Yeah, I mean one part is – I mean I know that most of us speak the language of data. So it’s a matter of being able to support what you want to do with proof that it’s worked for other people. Now, that may mean okay, “We saw that Copy Hackers did this split test on Dressipi where they tested really risky headline copy and this is the result that they got. And it worked out really well. So we won’t use the same language but hey, if they tried it and got good results, maybe there’s cause to do it. And look, they found their message, this risky language, they found it by going out and listening to how actual prospects were speaking and hey, we did the same thing, too and that’s how we landed at this risky message.” So you’ve got a couple data points there: 1) split test result 2) here’s a better practice which is finding your message in the words of your prospects and customers and just swiping from there, right? And then testing that. So you can bring a couple things to the table and say because of these – at least these two reasons, and there’s obviously more beyond that we can still get into. But because of at least these two reasons, this is why we’re proposing this as a split test, always understanding that a split test will at least help us understand if it worked, right? If it worked or if it could possibly work. And of course, a lot of people are open to split testing and knowing that there’s reduced risk if you expose the variation to small amounts of traffic so there’s that – there’s always gonna be people who don’t want to go out and try something different. And I think Joanna Lord said this well, and it’s something I’ve been hearing a lot of lately. And that is if the people around you are that resistant to innovation, to trying to find creative solutions and actually letting people who have creative solutions go give it a shot, fail fast but at least get it out there. If people are that resistant, then it’s time to find a new job or it’s time to fire the client. It’s time to move on from that place that doesn’t get that you have to try harder. That if you’re just going to do exactly what your competitors do and exactly what you did last year or the year before that, what you’re safe and comfortable with; you’re never going to get to a place where you can actually say you’ve achieved something, you’ve done something different. If people around you won’t let you do that, I would say if you can’t convince them with data, get the hell out. Dan: I think that’s a perfect hopeful note to end on. Joanna: That’s like the least hopeful thing. It’s time to quit your job. Dan: I don’t know. It’s taking a stand one way or the other, which I think is kind of what we’re talking about here, right? It’s like marketers coming in with a point of view and an opinion and going for it. And of course, this still needs to be tested but I think even underpinning those tests and those test hypotheses is like some sort of passionate insight or idea. And without that, then you’re just gonna have – you can test all you want but you’re just gonna be testing the same stuff over and over again, and testing things that you know have already worked elsewhere, and testing copy that you’ve seen on other people’s landing pages. And you’re just not gonna produce great results that way, I don’t think. Joanna: I agree. And you’re going to chase away those people who have the courage. Because you can only have the courage to present innovative ideas so many times if they keep getting shot down. So you’re gonna chase away potential stars on your team, people who actually give a damn just because you’re scared. So stop being scared. Stop being lazy. Stephanie: That was Joanna Wiebe, co-founder of Copy Hackers.